Purpose: Use this document as a reference for running the Aging process in ctcLink. 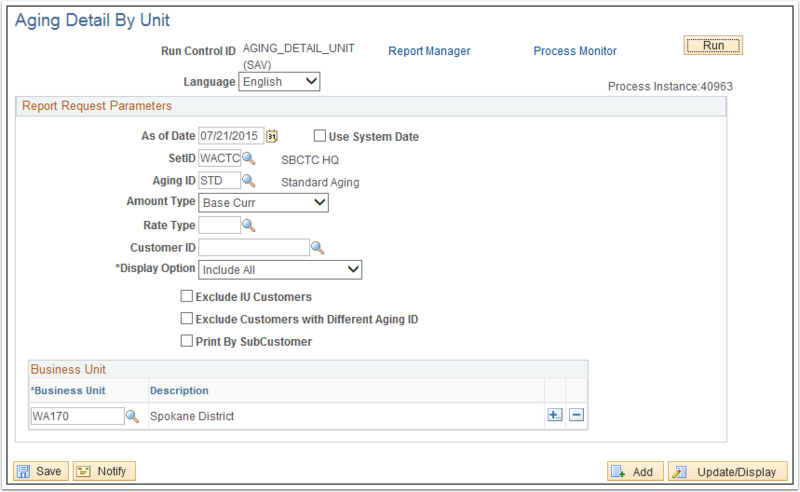 Run the Aging process to update and track overdue items. 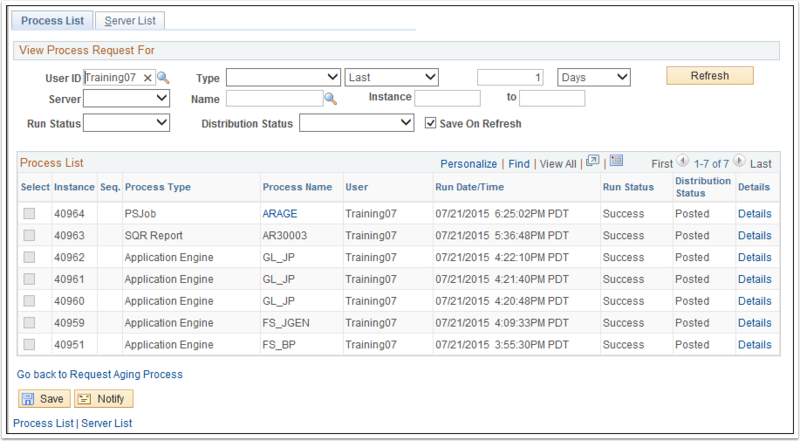 Enter an existing Run Control ID or click the Add a New Value tab on the Request Aging Process page to add a new value. Note: A Run Control ID is an identifier that, when paired with a User ID, uniquely identifies the process that is running. 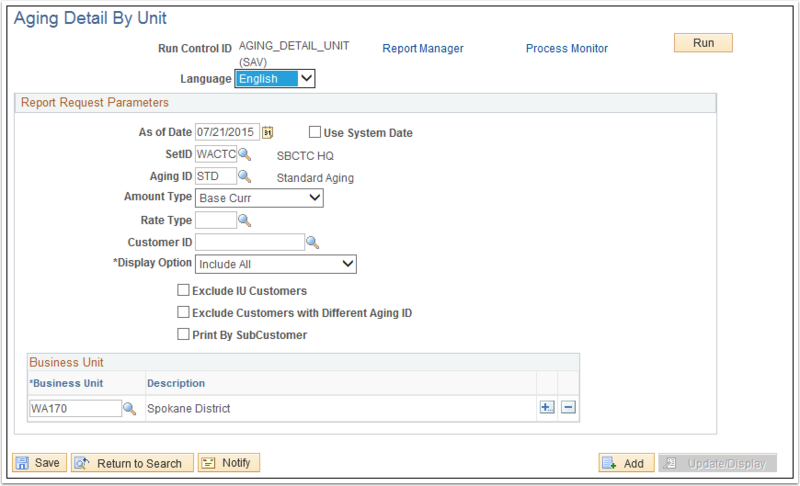 The Run Control ID defines parameters that are used when a process is run. These parameters ensure that when a process runs in the background, the system does not prompt the user for additional values. 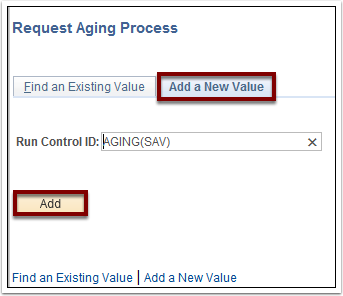 UseAging Request Parameters section of the Aging page to enter the request parameters. 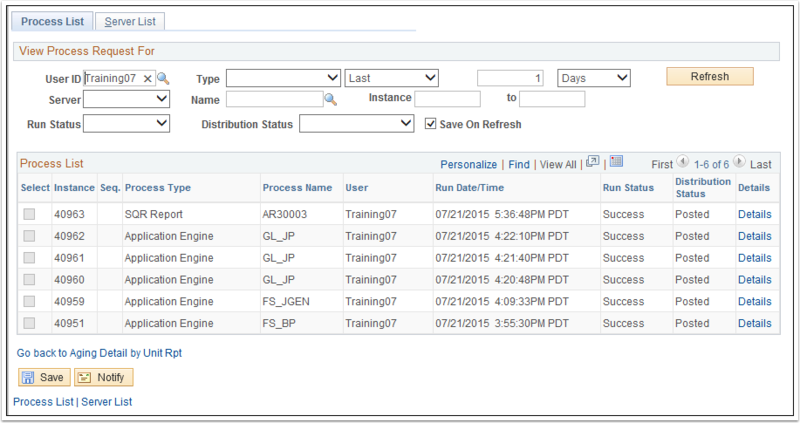 These parameters will be used to define the processing rules and data to be included when the process is run. 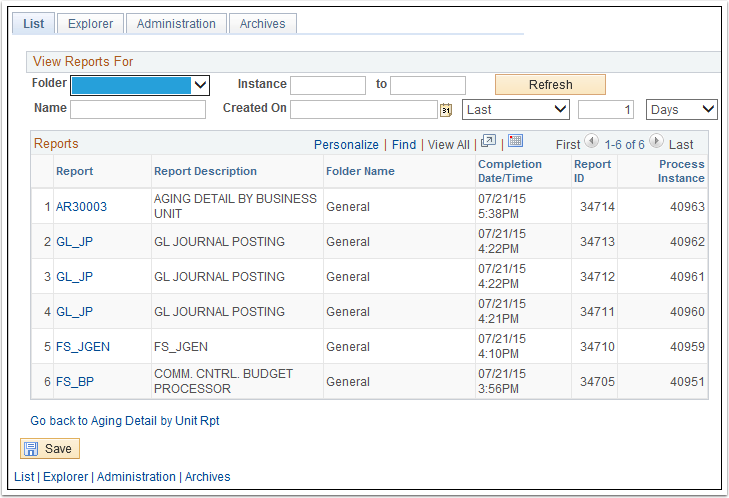 If it didn’t default, enter or select the business unit in the Business Unit field. Use the Process Frequency drop-down button to select the ‘Always’ option. Note: This field can be left blank. Select the PS/AR Aging – Preprocessor checkbox. Use the Type dropdown button to select the ‘Web’ option. Use the Format dropdown button to select the ‘PDF’ option. Note: A Process Instance number appears. This number helps identify the process that has been run. Click the Process Monitor link. Use the Process List page to view the status of submitted process requests. ctcLink enables the viewing of aging in six different buckets: by ChartField, by Reason, Detail by Tree, Detail by Unit, Summary by Tree, and Summary by Unit. This QRG will document running the Report for Aging Detail by Unit. 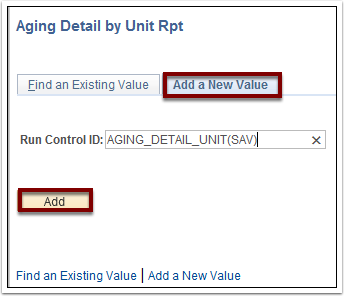 Enter an existing Run Control ID or click the Add a New Value tab on the Aging Detail by Unit Rpt page to add a new value. 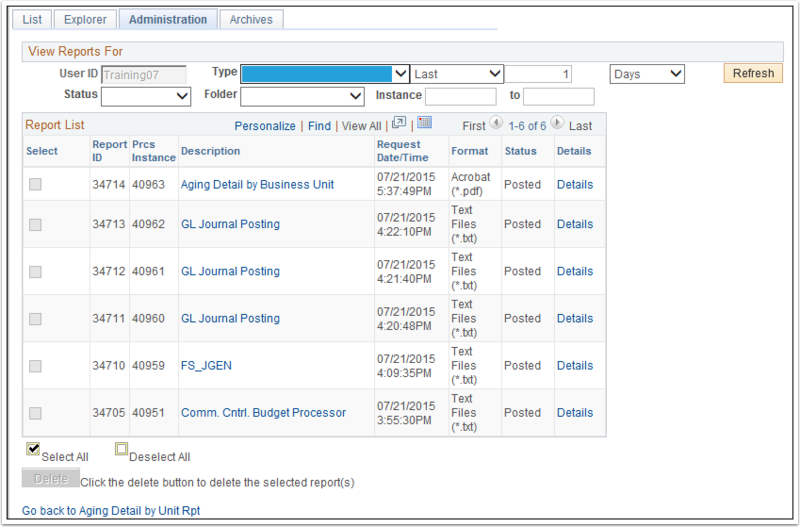 Use Report Request Parameters section of the Aging Detail by Unit page to enter the request parameters. These parameters will be used to define the processing rules and data to be included when the process is run. Enter and select the appropriate aging ID in the Aging ID field. 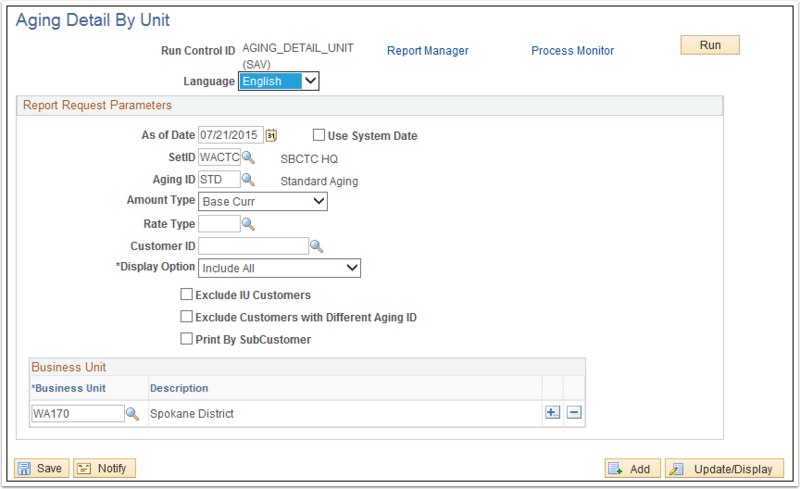 To run the Aging Report for a specific customer, enter or select a specific customer in the Customer ID field; otherwise, leave the field blank to run for all customer open items in the business unit specified below. Enter or select the appropriate business unit in the Business Unit field. Note: The field can be left blank. Click the Go back to Aging Detail by Unit Rpt link. Click the Report Manager link. Click the Aging Detail by Business Unit link in the Description column.